Great special kitchen features offering custom ideas for storage or function. 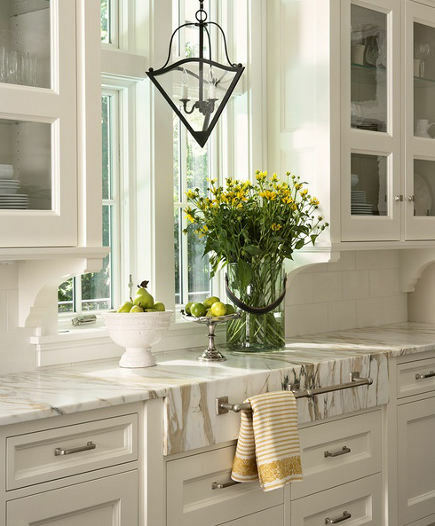 Whether they are generated by a kitchen designer, snipped from a magazine or a blog, or sprout from last-minute decisions by a cook who knows what he/she needs, special kitchen features are always unique and useful. My own kitchen has a plate rack I cut down and used in place of upper cabinets that would be hard to reach. I was also able to turn a measuring error by the cabinet shop into tall, but super handy shallow pantry shelves on each side of the fridge. Allison’s kitchen has a unique hutch and island. In a previous post, I showed Ten Special Kitchen Features — here are nine more. 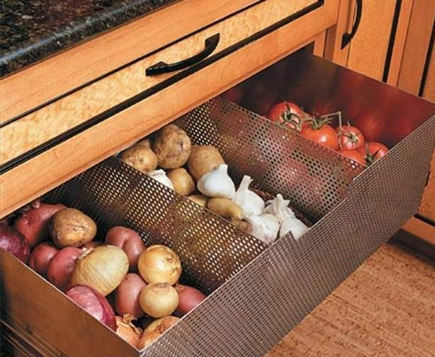 1.Ventilated Vegetable Drawers [top] – The best spots store onions, garlic, potatoes and root vegetables, or allow avocados or tomatoes to ripen are dark, cool and well-ventilated. A specially designed stainless steel drawer – with a perforated front and dividers – is worked seamlessly into a bird’s eye maple base cabinet. It looks great and provides superb function. While the fabrication of a drawer like this can be very costly, variations with sturdy screening or other types of industrial style mesh would create a work-around. I would love to have two of these in my kitchen as my current storage solution for such items is a basket on a pantry shelf. 2. Double-Decker Pot Drawer – Pots and lids are always a storage conundrum. This unique approach uses the bottom pull out for the pots and the top one for lids. But instead of putting pull outs behind a pair of cabinet doors, it treats both of them as drawers – the bottom with a tall, faux-double door front and the top hidden behind that. 3. Floating Cutting-Board Drawer – I’m of two minds about the placement of this pull out in this kitchen by Casa Verde Designs, which was a Wolf-SubZero award winner. 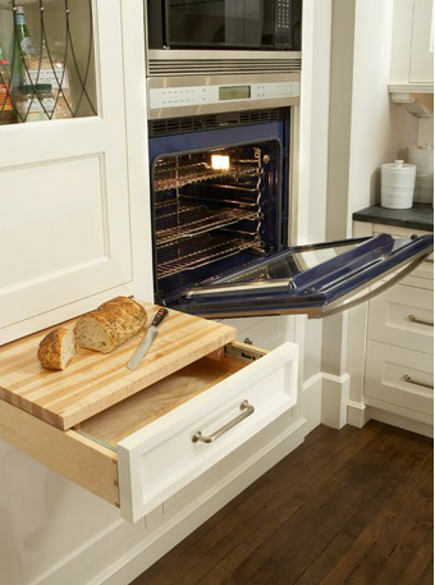 First, this is a very clever way to provide setting down space adjacent to an oven that floats in a cabinet wall without any counters on either side. I can see using it to keep pot holders, tongs, bread-baking paraphernalia and other oven necessities nearby, and for keeping that type of flat implement in a handy drawer under the board. I even can see using the board, with a trivet, as a landing spot for small hot baking dishes or pies coming out of the oven. But second, it seems odd to design it as a bread-slicing board since the slicing motion would compel any drawer to jiggle and crumbs would inevitably land on the floor. While not dysfunctional, this looks like the idea of someone who doesn’t cook very much and almost seems too clever by half. 4. 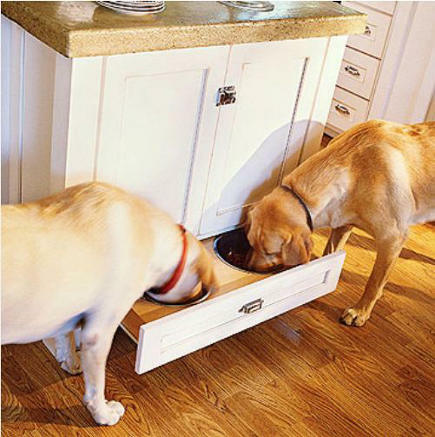 Dog-Bowl Pullout – This is such a no-brainer treatment for pet bowls. Easy to fill, clean and stow leaving nothing to kick over or trip on. The pooches seem to love it, too. 5. Tandem Cutting Board-Garbage Pull Out – My Grandma’s 1950s kitchen had a rickety cutting board that pulled out of the cabinet. This maple beauty is not only beefier but far more ingenious. 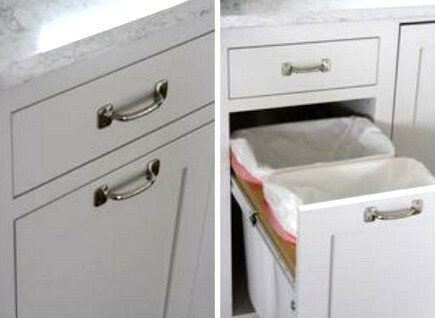 Most cabinet designers will place a drawer over the combi garbage-recycling bin pull out. I have that set up in my kitchen. So I prep on a cutting board and sweep debris right off and into the front bin of the pullout – no mess on the counter. Serena, a Washington State blogger, replaced the drawer with a cutting board pull out, complete with circular chute with a length of plastic tubing below to help direct things into the front basket. Details of the cabinet are shown on Serena’s The Farm Chicks site. This is a brilliant DIY idea. I do have a quibble with the placement of the chute front and center, since the size and placement cuts down on work space. My preference would be to push the chute farther back on the board. Either way, care must be taken to line things up before so the carrot scrapings don’t litter the recycling bin. 6. 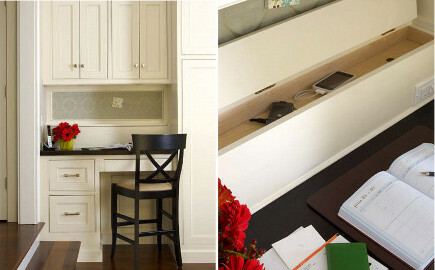 Hidden Charging Station – Just above a perched desk tucked into a kitchen passageway is a shallow hidden drawer where phones and other small devices can be plugged in for charging. This has major neatnik appeal and certainly conceals the usual mess of tangled wires. The out-of-sight, out-of-mind placement might also provide a break for the phone-check obsession many of us display. 7. 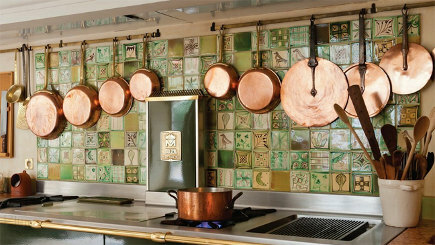 Backsplash Utensil Rail – A pair of simple metal rods, attached at the top of this backsplash, just under the hood, provide convenient hanging space for copper skillets and lids or other utensils. While this set up is particularly effective over this 5- or 6-foot long Molteni range, in a French chateau kitchen, it could be done singly over a smaller stove. Ikea offers a utensil rail system that might well be adaptable in this way. 8. Front-Mounted Towel Rail – The treatment of this towel rail is almost too beautiful for its purpose though much of that is due to the exquisite figuring of the Calacatta marble used in another Casa Verde kitchen. To create a sturdy showcase for the towel bar, a piece of marble simply replaces a drawer front. I’ve seen this done in front of a sink, which always strikes me as a hip-bruiser. This placement is more intelligent and does double-duty underscoring the window a focal point. 9. 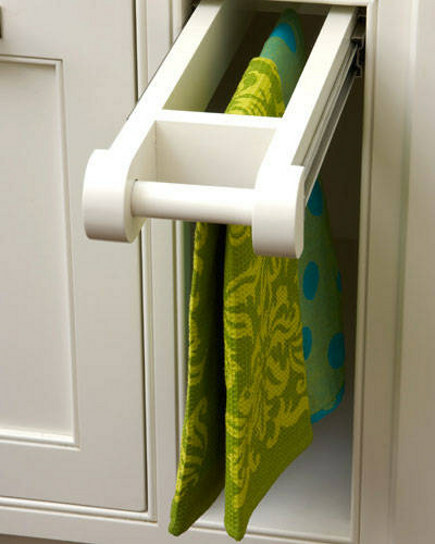 Recessed Dish-Towel Pull Out – Six to eight inches left over on a sink cabinet wall can provide the perfect opportunity for a handy pull out that’s idea for hanging wet or dry dish towels and cleaning cloths. The rectangular frame has a large dowel down the center, while a shorter length of dowel creates a handy pull. Here’s a “steal this” photo if ever there was one. We are planning our kitchen remodel and these are some great solutions! I will be keeping this link for reference! AMAZE ME MONDAY is up, would love for you to come share! Love these ideas! I have pot drawers and the pull out garbage and I cannot imagine life without them. Thanks for sharing. 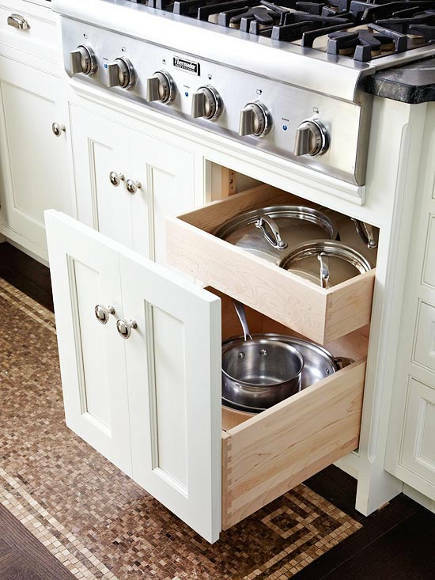 Some great ideas here — I really miss the big deep pot drawers I had in a previous house. Thanks so much for stopping by my blog. I don’t know if I am going to survive these renovations or not! these are some great and very practical ideas! 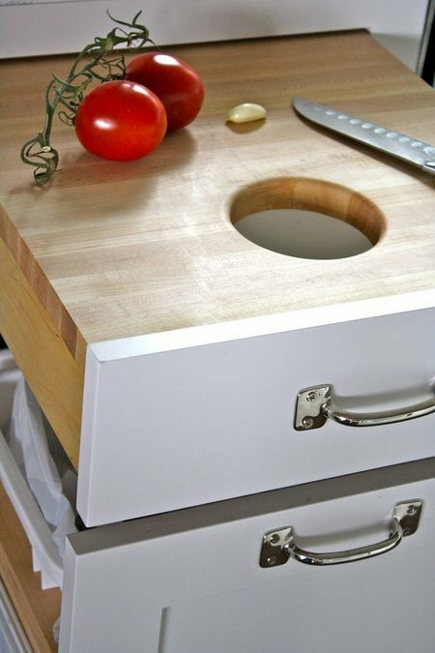 The cutting board over the trash is a great idea, but I’d want it larger. I do find with sweeping off the island into the trash, which is a pullout there… EXCEPT when I have some sort of brain lapse and open the knife drawer above the trash and sweep crumbs or trimmings into it! lol. I’ve seen pet stations at the end of islands, but either never saw a drawer or noticed that it was a drawer. So nice that it can disappear after the dogs are done eating. One thing I miss about having a wood paneled, hidden dishwashers instead of an integrated, but metal front dishwasher, is the wide handle and waterproof panel for hanging kitchen towels. This is a neat looking solution. RHome, I thought the same thing about the potatoes and onions. ;D That is an odd place for the cutting board, Roc. I’d love to have a pull-out cutting board over the garbage but w/o the “drawer” part underneath – I wouldn’t want to loose drawer space. Like you, my grandmother had a pull-out cutting board and it was above a regular drawer with base cabinet below. The potatoes and onions are the stylist; ditto garlic and potatoes. Done for color I expect. Funny rhome, I do something similar over the trash bin. Drawer over that is our cutlery — my carrot peelings occasionally fall in there. The only thing with any cutting board — I don’t care for them as pull outs because they jiggle. Perfect one for me is on a 34″ high counter. But my prep space on the counter above my trash bin is good because I can put a big board there, as I did today, and just sweep stuff into the bin. That pull out cutting board had an ingenious chute set up but the ones that are firmly built in always strike me as difficult to clean. Simple is best in my book. Yep, not a fan of any pull-out cutting boards.. Small, jiggly, adding corners and knives into an aisle… and too easy for them to get shoved into the slot dirty. Yuck! Just happened on this website. What a delight. Such cute .